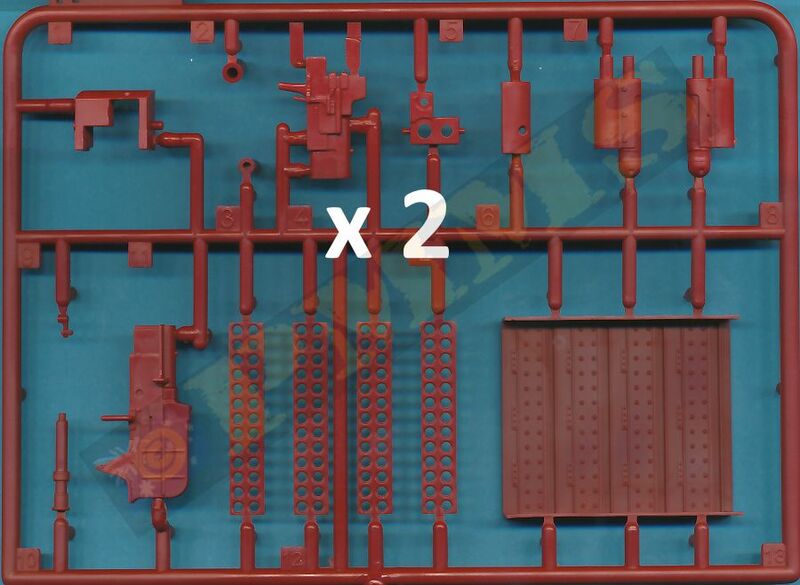 This is the first kit released from new company Takom and even though the FT is a small vehicle the size in 1:16 scale is quite impressive. 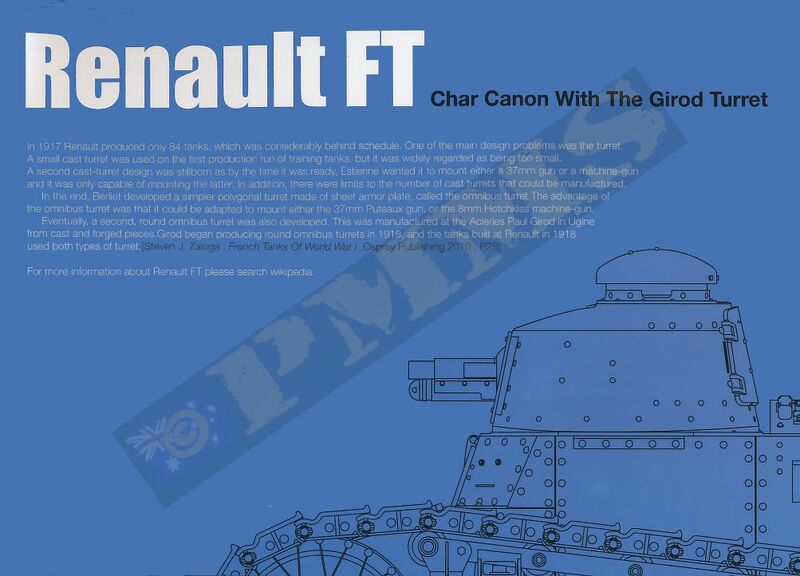 The kit represents the French built FT-17 with the cast Girod turret and armed with the 37mm Puteaux SA18 gun. 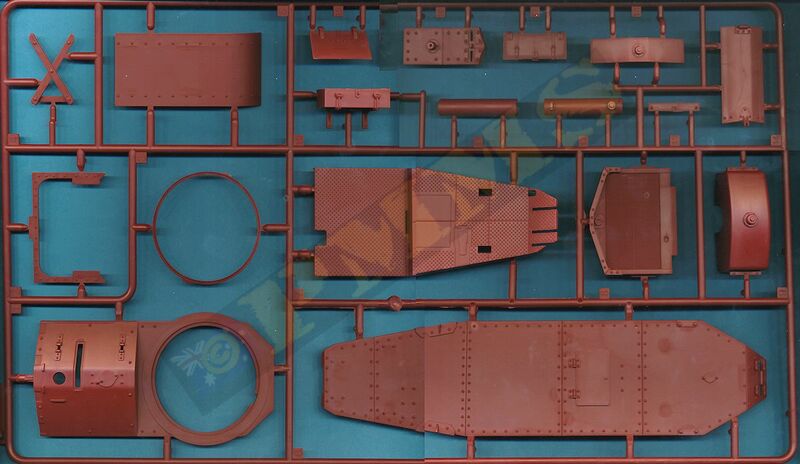 This is just a preview of the kit contents along with my initial impressions with a more detailed look at the details and accuracy to follow with a full build as time permits. 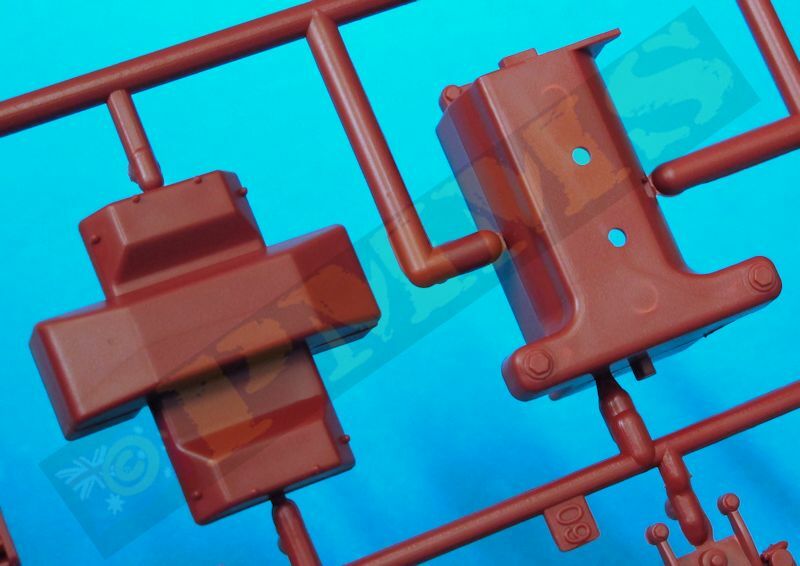 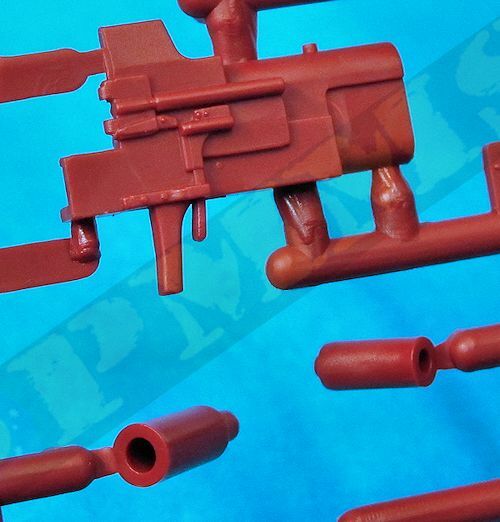 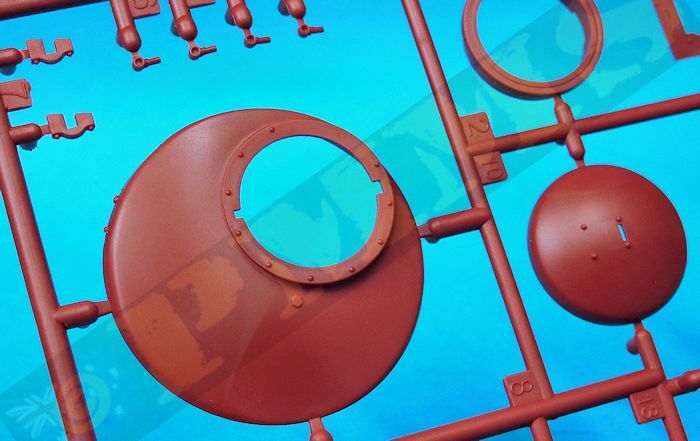 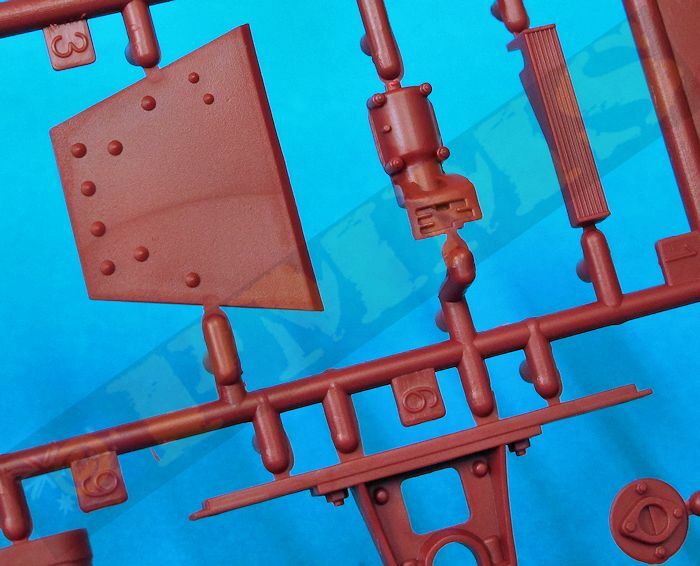 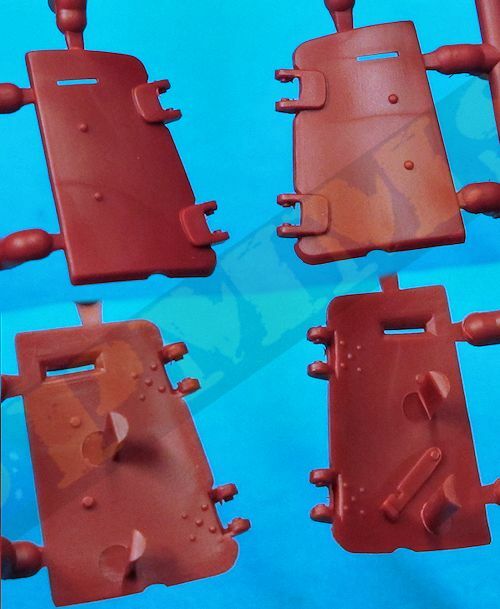 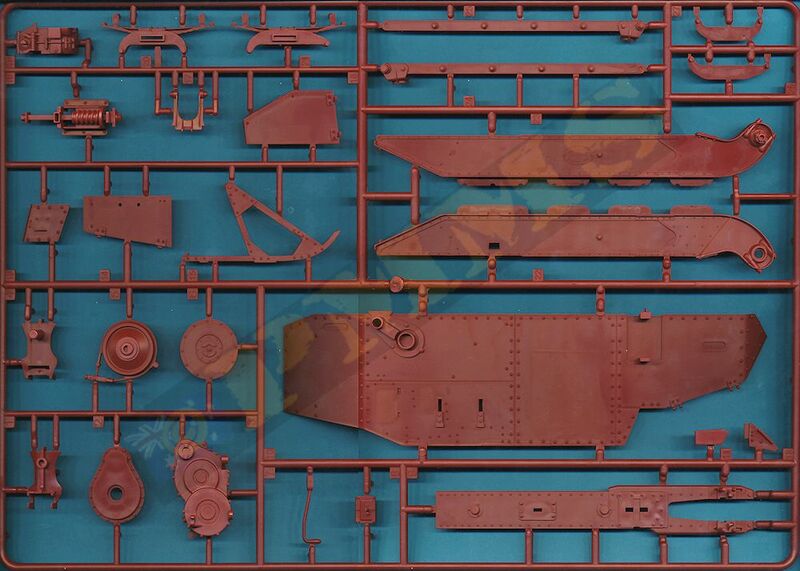 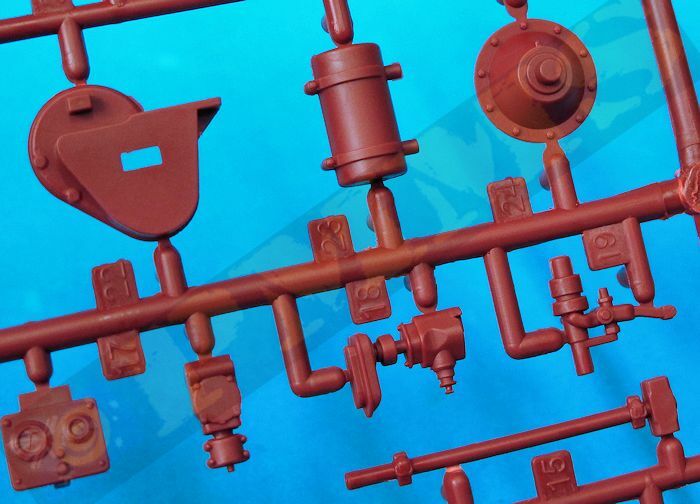 The kit is cleanly moulded in a fairly garish dark maroon plastic with the moulding of a high standard overall, there is a little fine flash on some parts and quite a few shallow pin ejector marks on the inside of the parts such as the hull, hatches and other details, this is mostly due to the parts not having the additional moulding “nodes” seen on contemporary kits these days with also serve as the knock out points for removing the parts form the moulds. 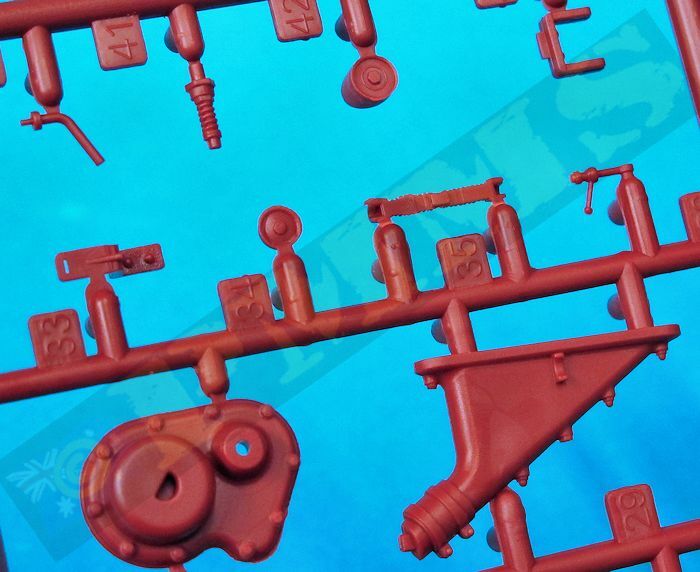 There is also a little remaining mould release agent on my kit and a quick dunk in a detergent bath and light scrub will remove any remaining greasiness from the parts before proceeding. 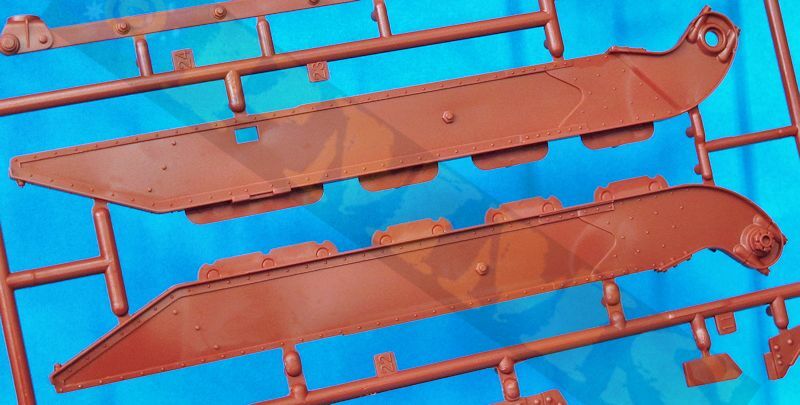 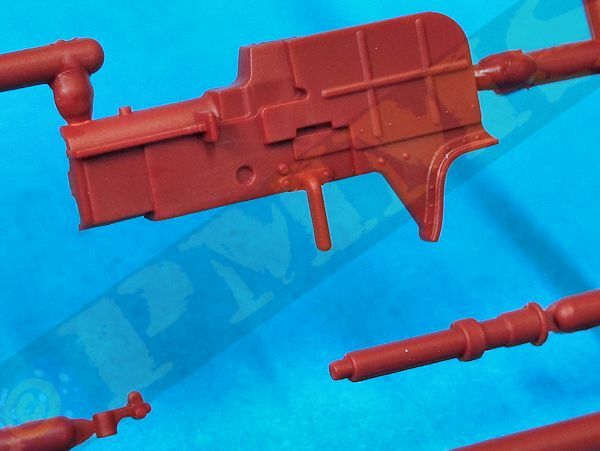 There are some etched brass parts included for the Driver’s seat backrest and other smaller details and the brass has an anodized coating in the same maroon colour as the plastic and I’m not sure at this stage if this will need to be removed to glue the parts, this will be determined with the build. 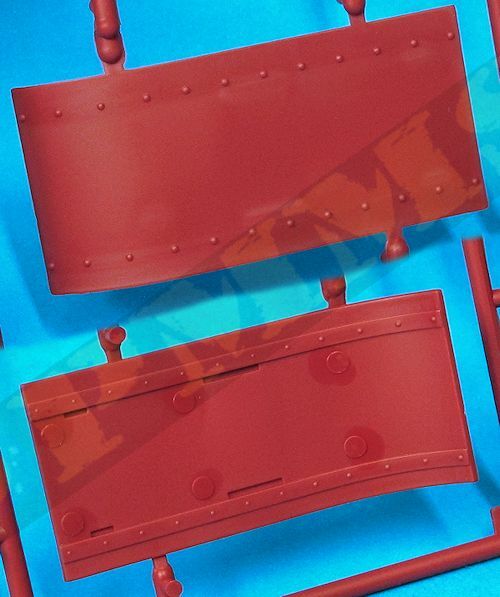 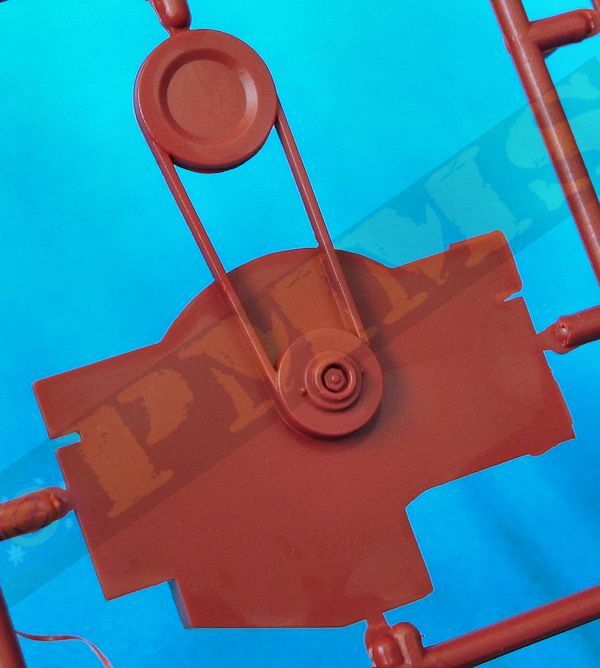 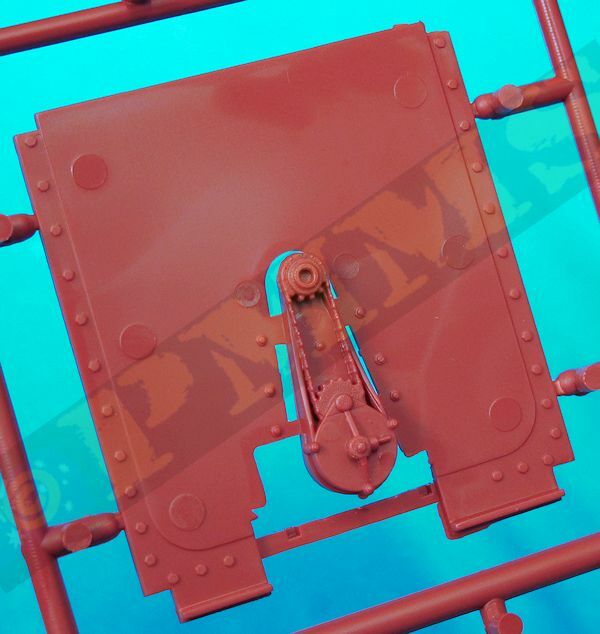 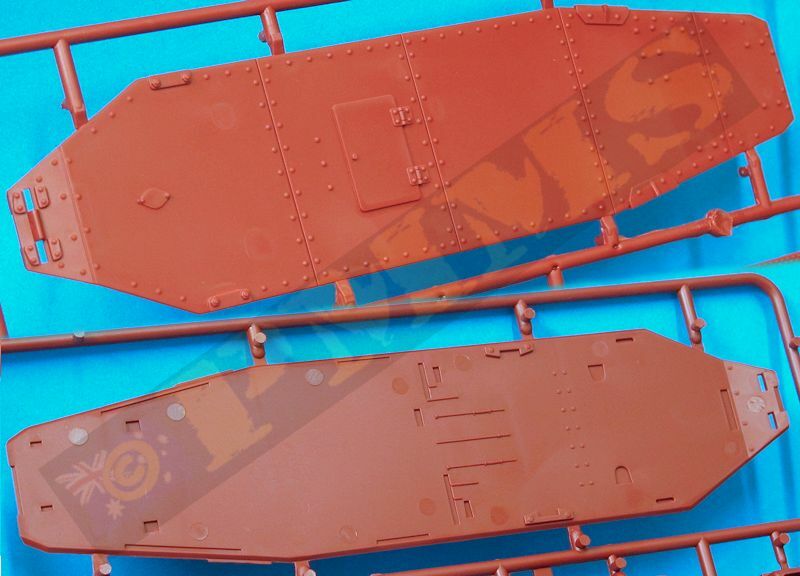 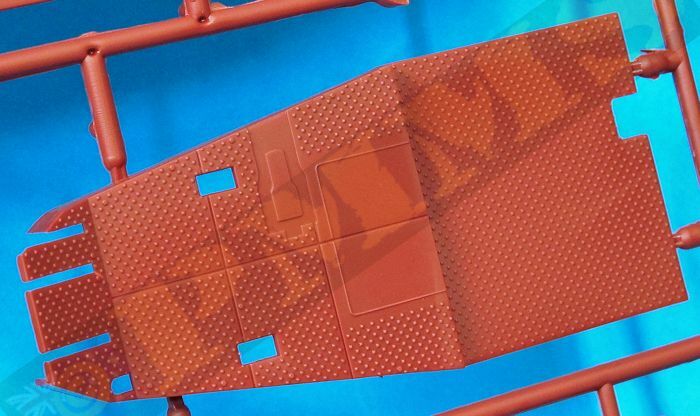 The separate hull plates have rivet, bolt and other details on both sides as do the large hull hatches as well as some pin marks to be removed as mentioned. 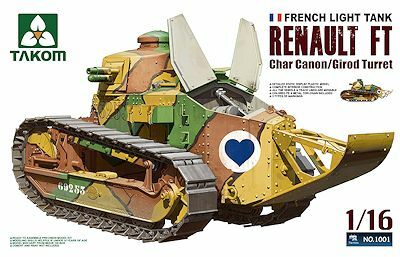 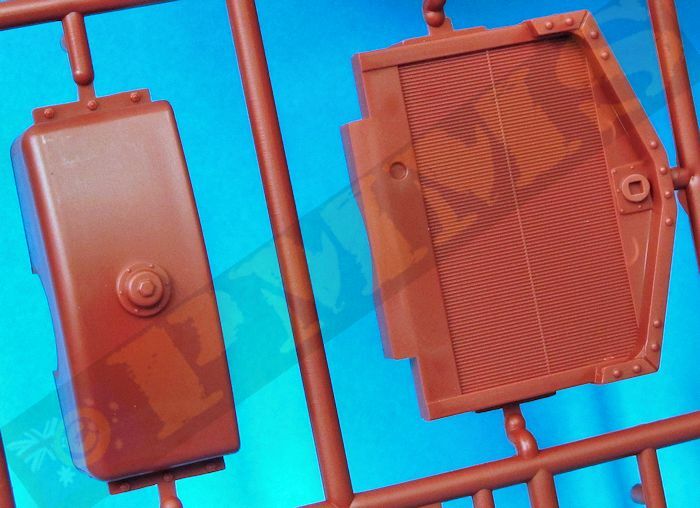 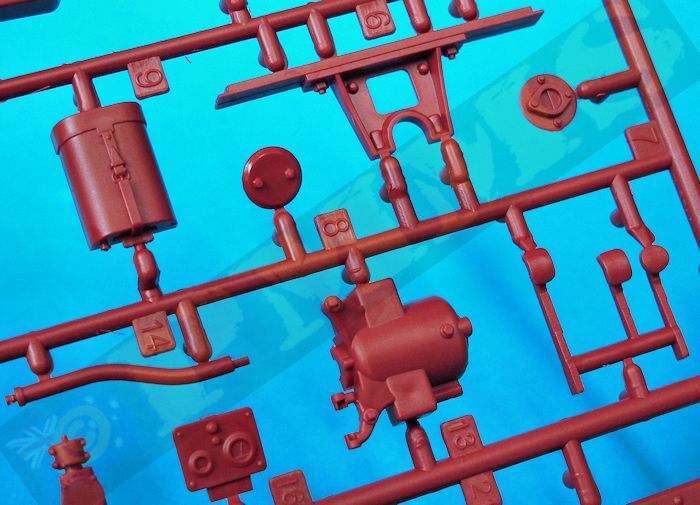 Details in the kit include the full Renault 4-cylinder 4.5 litre inline liquid-cooled petrol engine and transmission along with the large radiator inside the hull as well as the fully detailed Driver’s compartment and full breech for the 37mm turret gun. 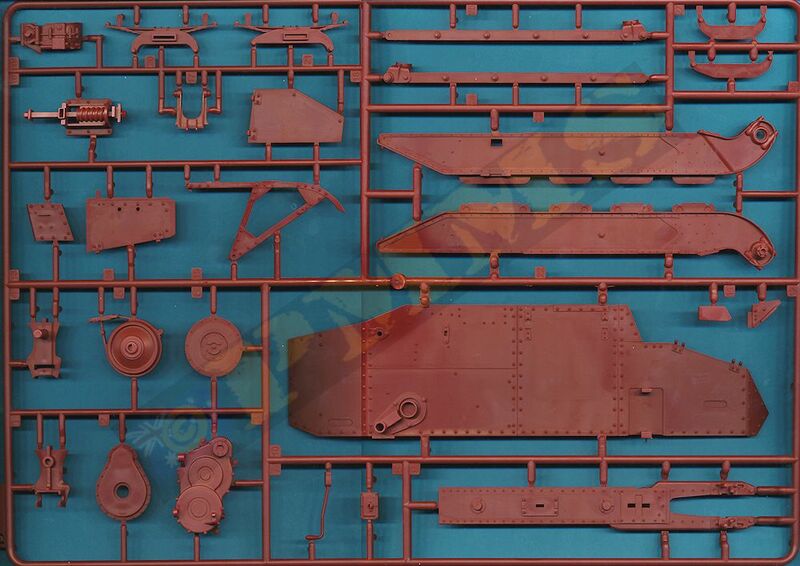 The hull details look most impressive and with just the inclusion of some additional engine wiring should build into a very busy and impressive interior which can be fully shown off apart from the hidden transmission and radiator when leaving the large rear and front hatches open. 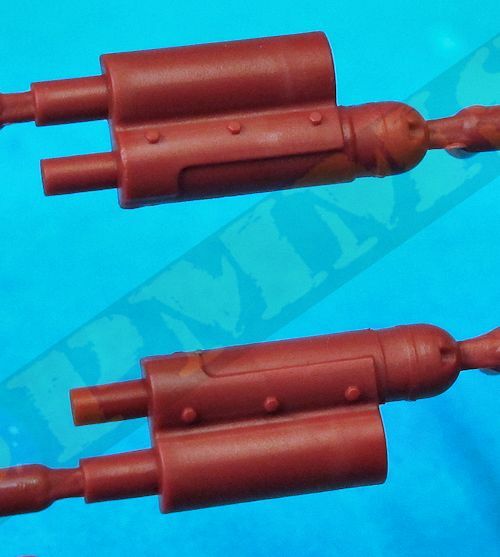 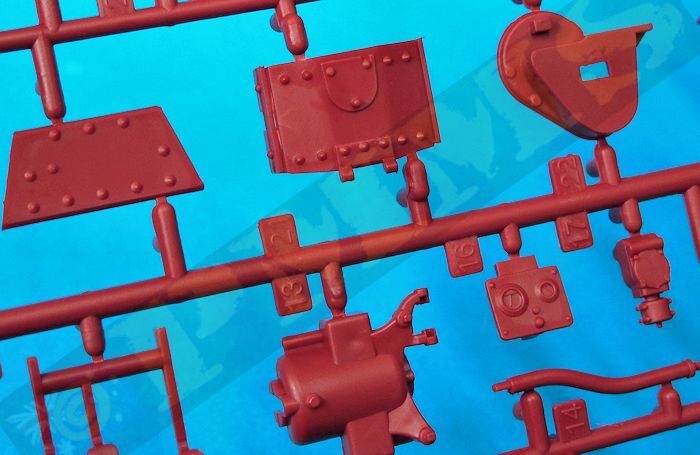 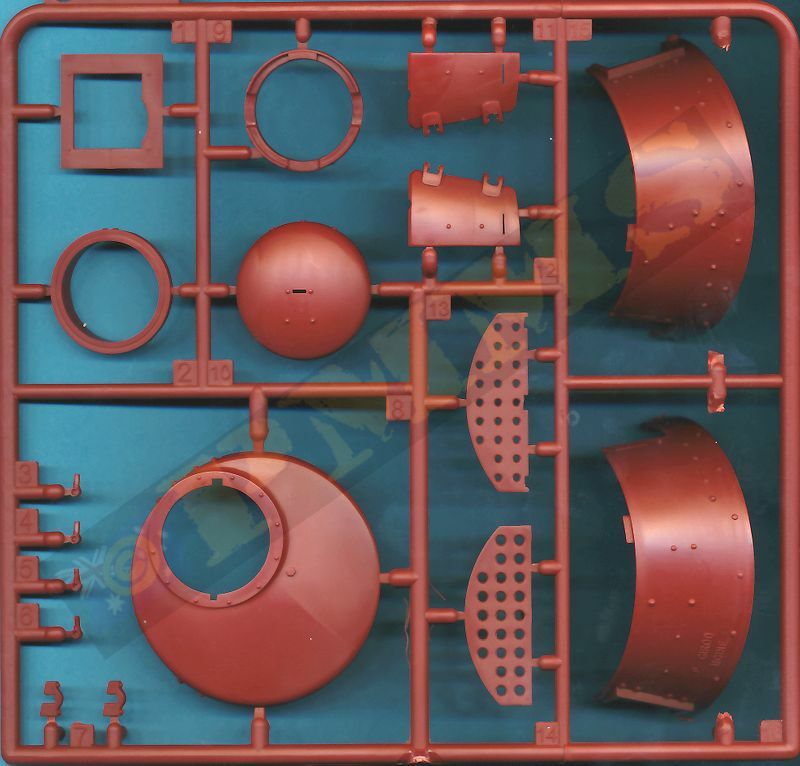 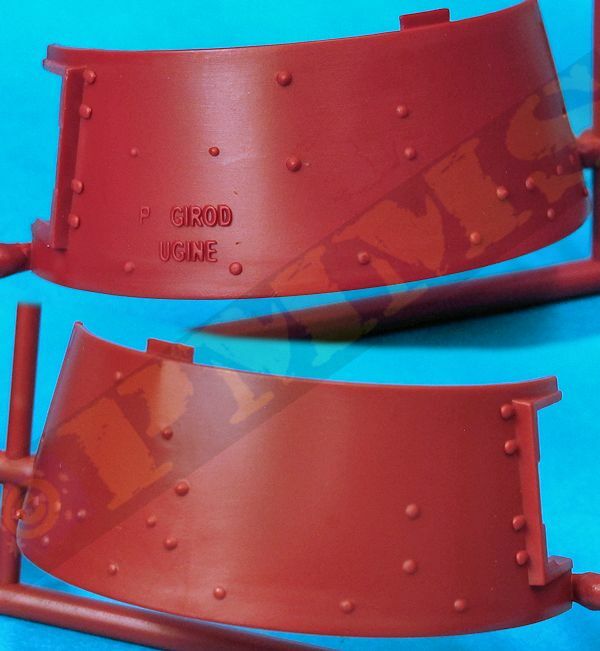 The kit parts such as the suspension, hull and turret don’t have any surface texturing and adding some cast texturing on the turret with Mr.Surfacer would be helpful, there is cast lettering on the turret of “P GIROD UGINE”, “Girod” being the manufacturer and “Ugine” being the location of the foundry and the Renault badge on the left suspension beam for added detail but not on other parts such as the suspension would could have been possible in this larger scale. 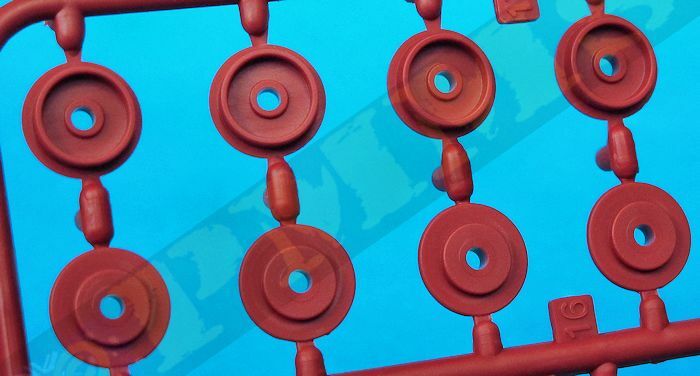 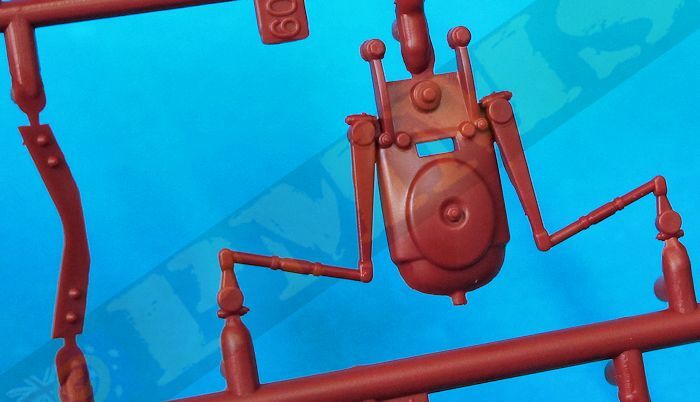 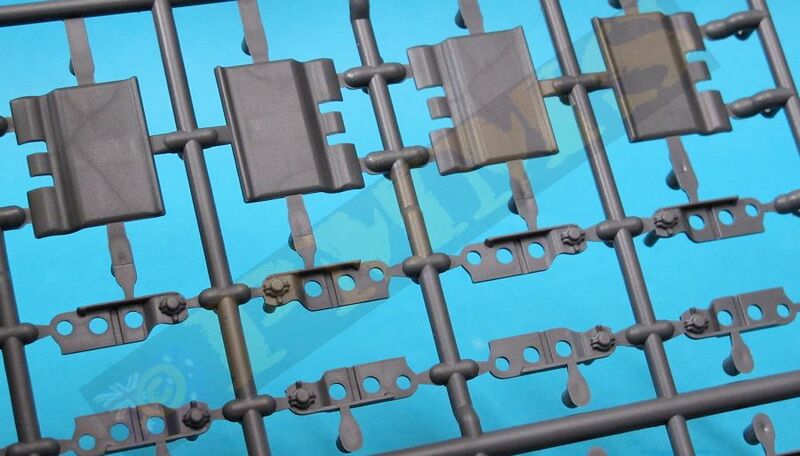 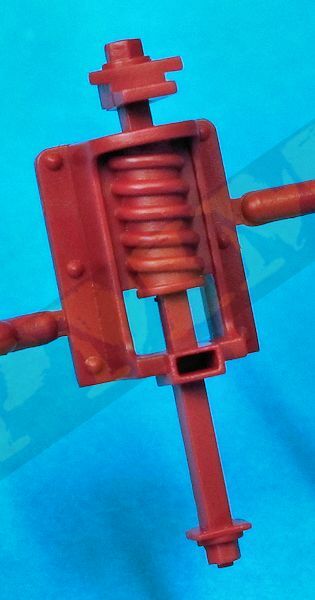 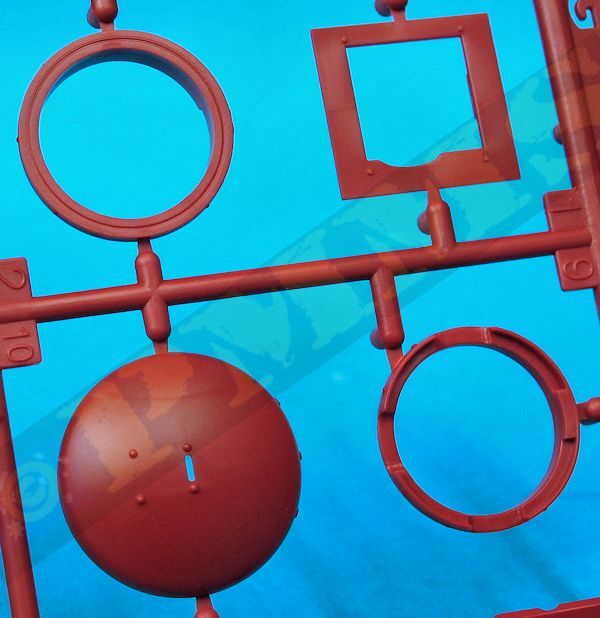 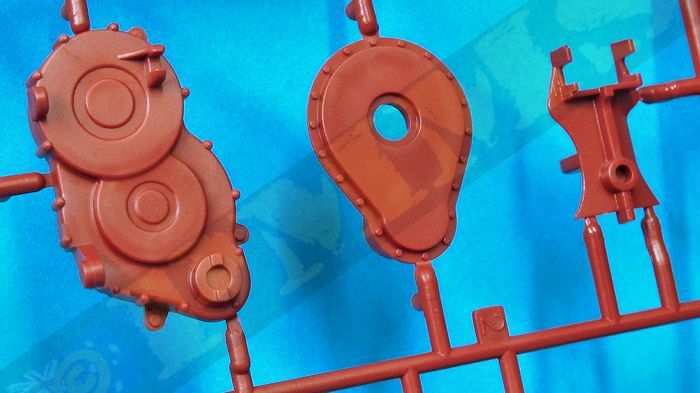 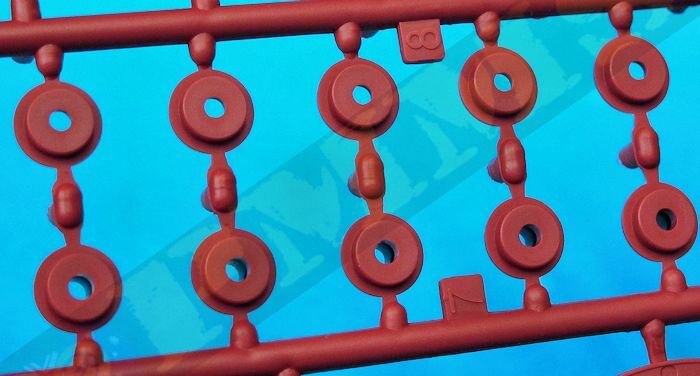 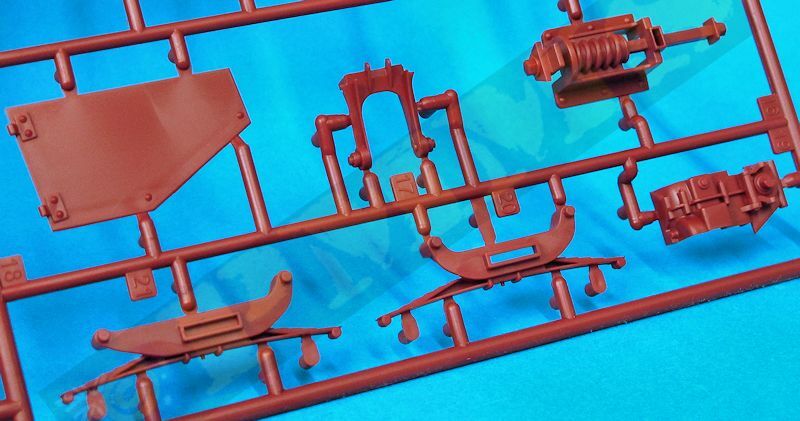 While on the suspension, the large suspension springs are moulded in solid plastic and noticeably lack detail definition and this could be improved by replacing the moulded springs with real springs or coiled wire to improve the appearance, this basic spring detail sort of grabs your attention in this scale. 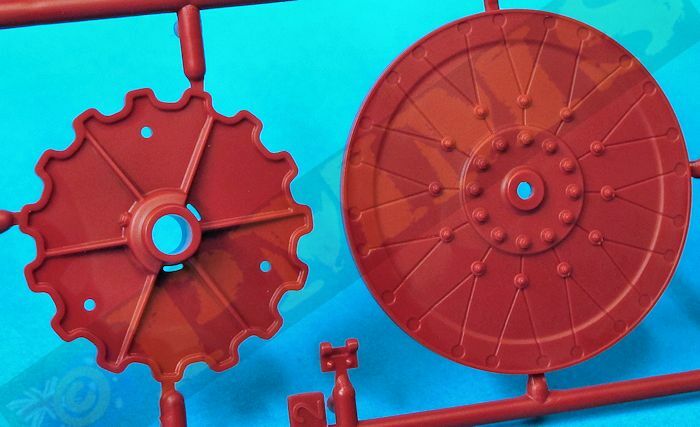 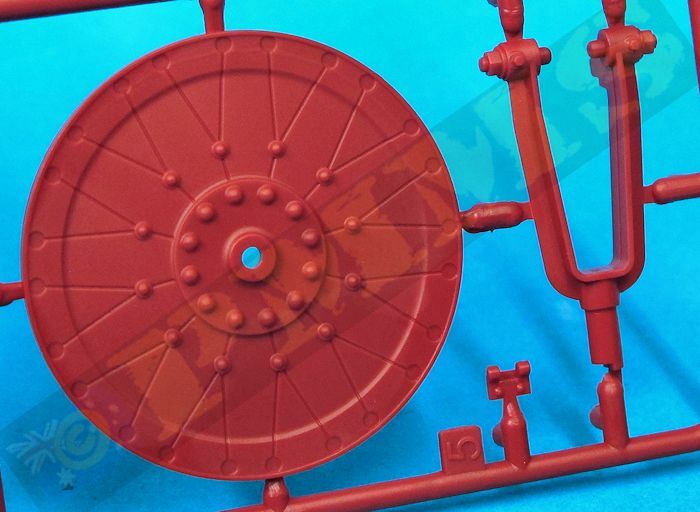 The large idler wheels are the wood type but also lack any surface texturing other than the rivets and the engraved lines separating the triangular wood sections that make up the wheels and adding some fine wood grain effect could be a suggestion? 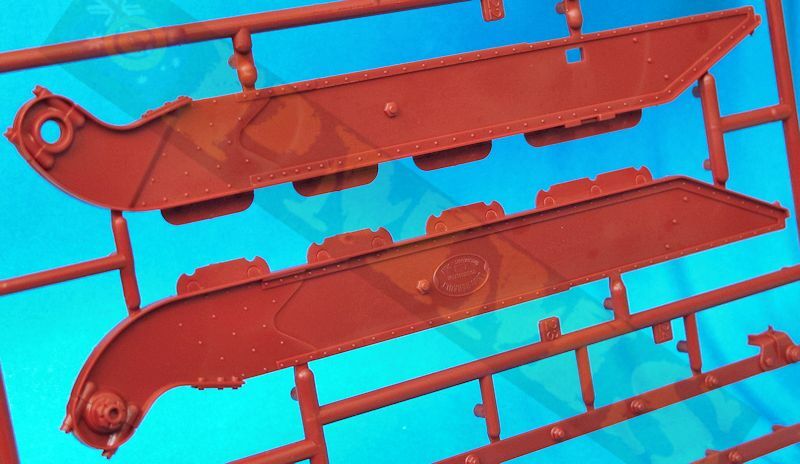 Many of the rivets on the actual hull are not perfectly round but have small flat edges on either side to allow the rivet head to be gripped during construction, while others appear to be round in profile. 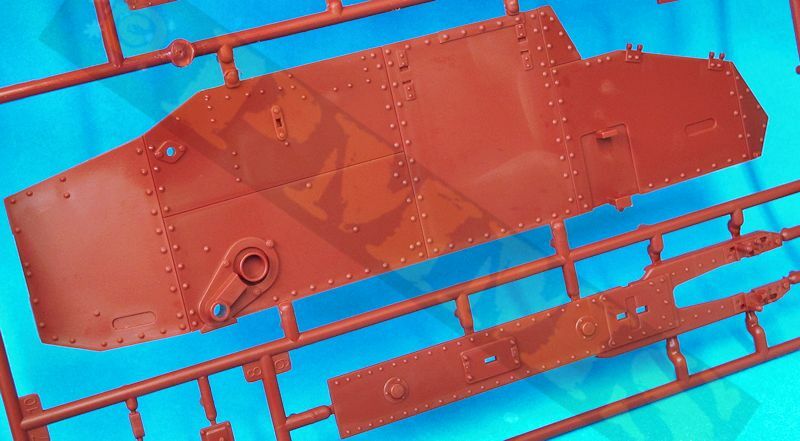 All the hull rivets on the kit are round in profile lacking the flat edges of the rivet heads which would be more noticeable in this scale than in 1:35 and it would have been nice to have this rivet head detail included given the scale of the kit. 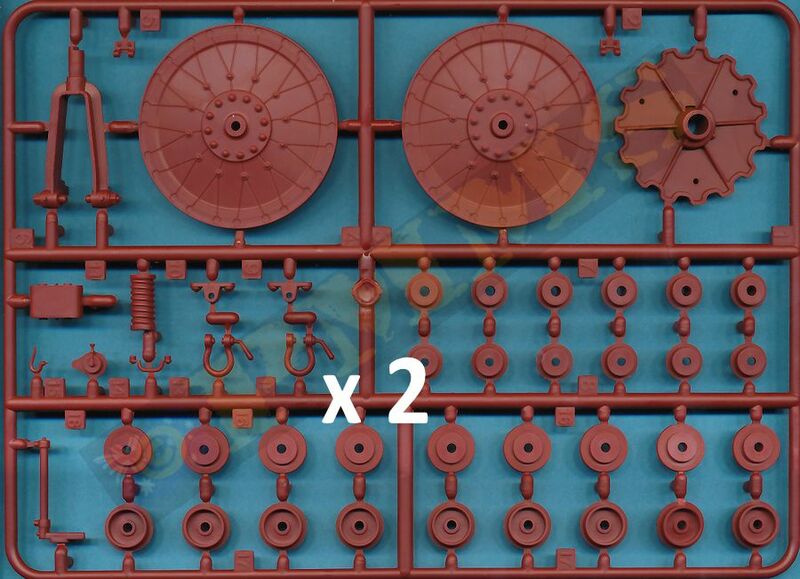 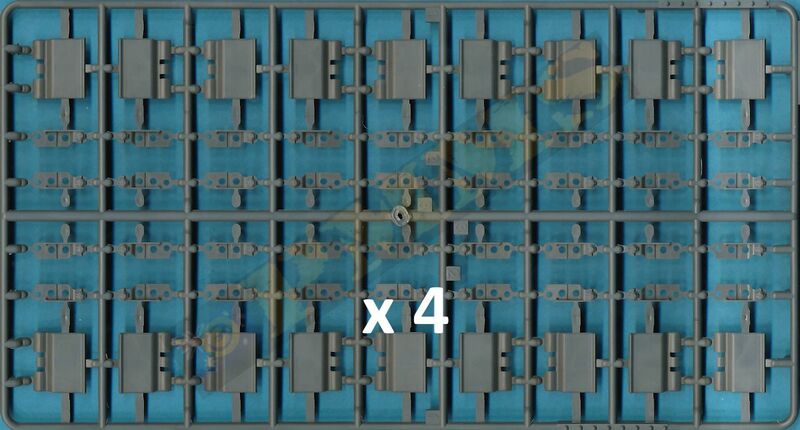 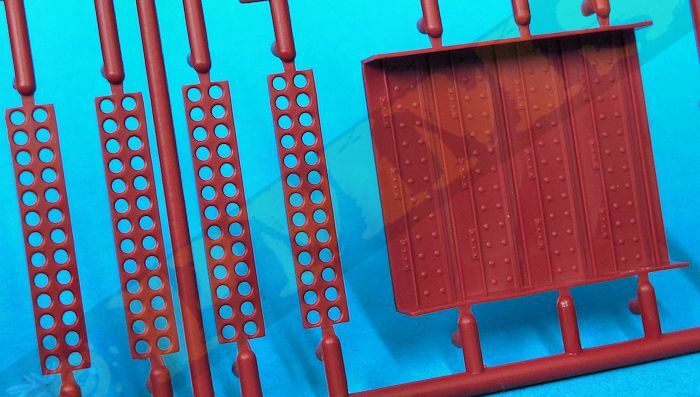 The tracks are individual link working track with the inner brackets also separate and you simply glue the brackets to the inside of the links as you join the links together to for the track runs, these are the correct size for the 32 links required per track run. 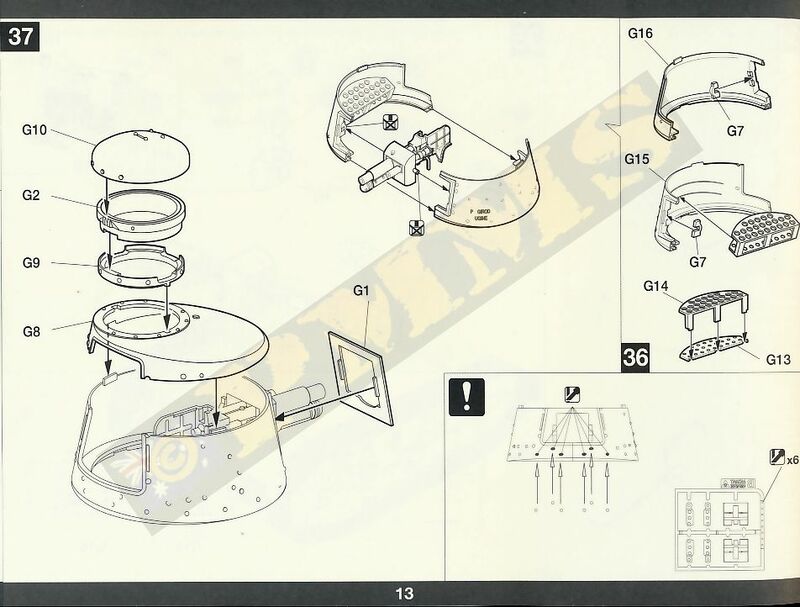 The turret is moulded in two halves with the roof separate along with a three part cupola and the join line of the roof is an actual weld on the real turret so the join can be used as a guide to add the weld seam, some of the rivets moulded on the rear and front of the turret are deformed due to the angle of moulding and relacing these will improve the appearance. 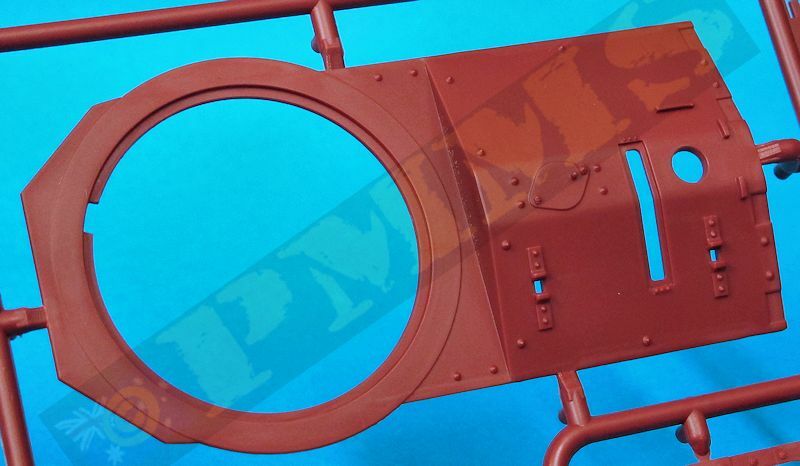 On the interior is the full breech for the 37mm gun and the turret wall ammo rack although as no rounds are provided for this it will be empty unless you acquire some suitable rounds from elsewhere. 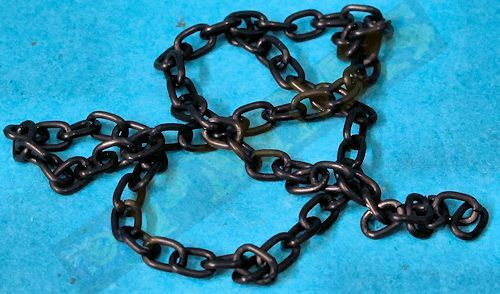 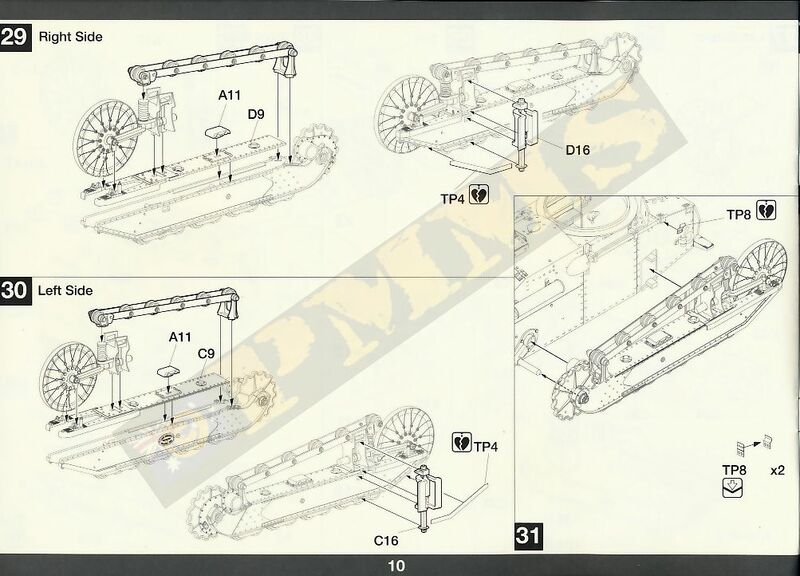 Also included is a length of course chain to drape over the rear trench skid as was often seen on serving vehicles and this is a nice inclusion. 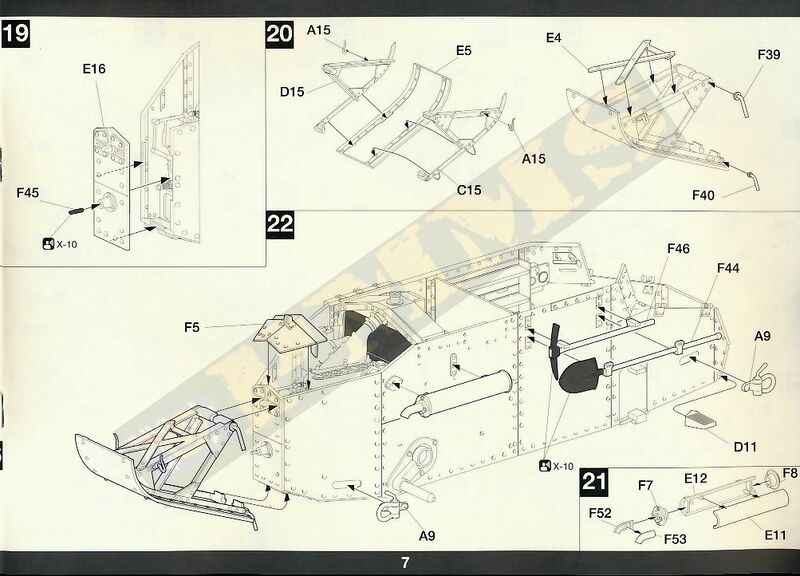 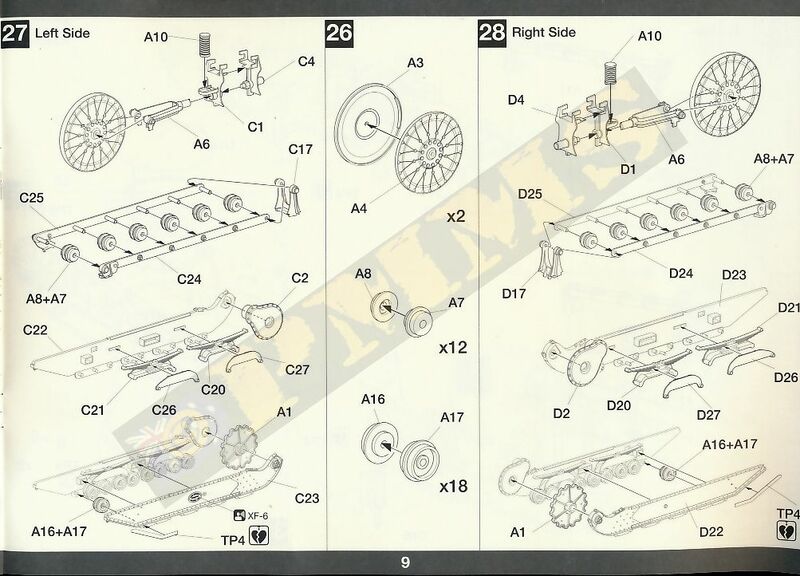 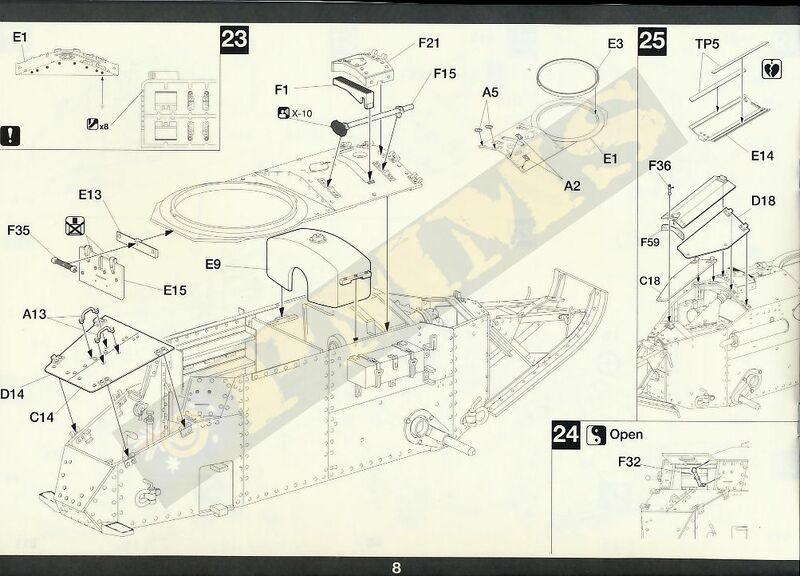 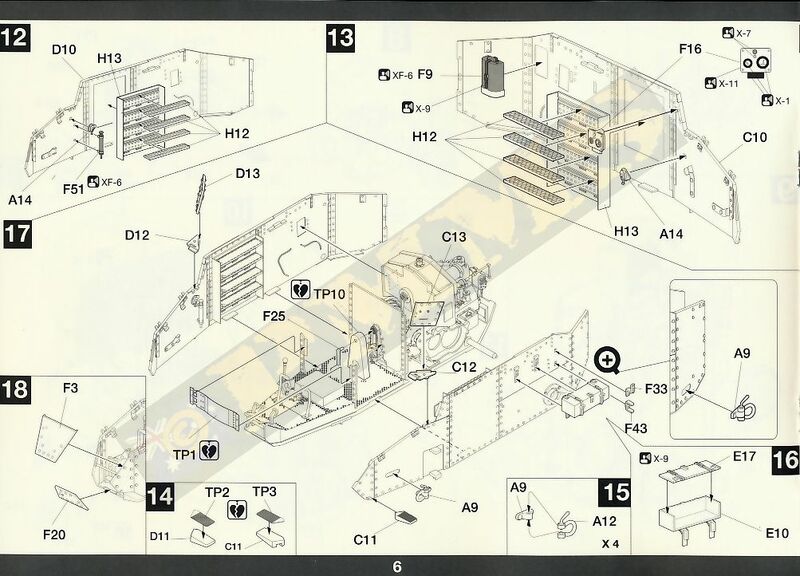 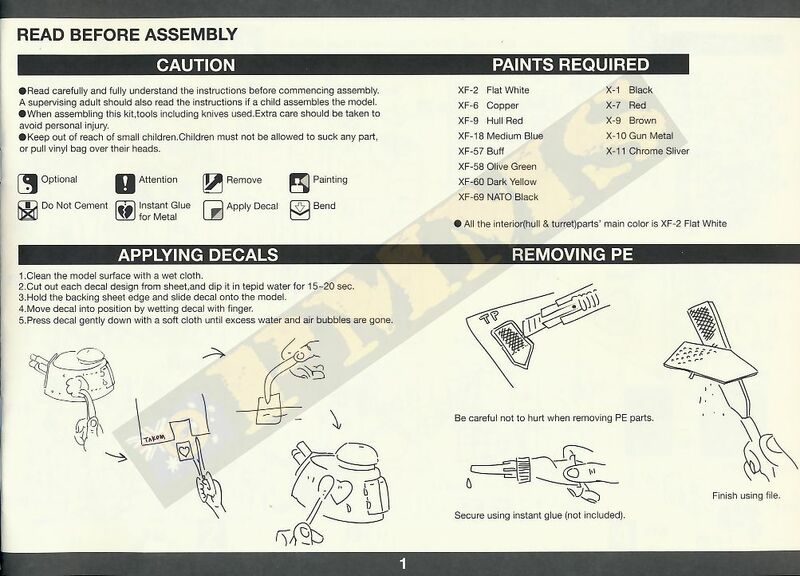 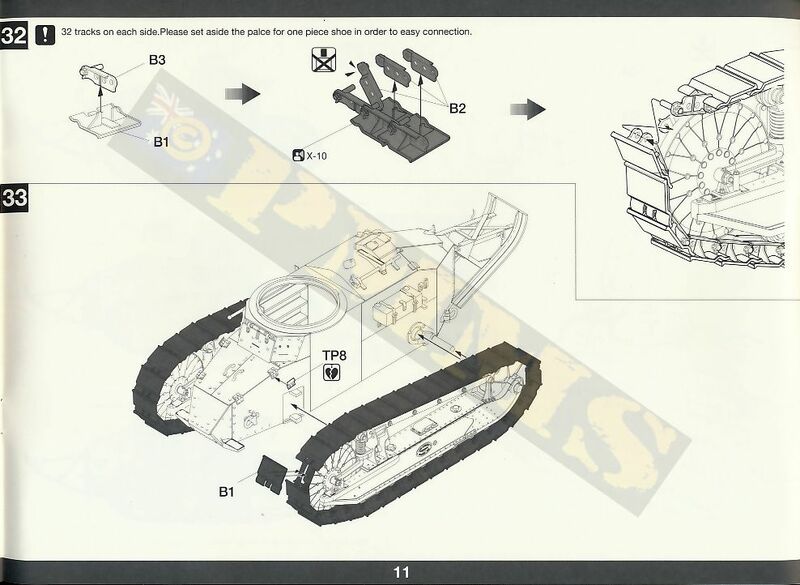 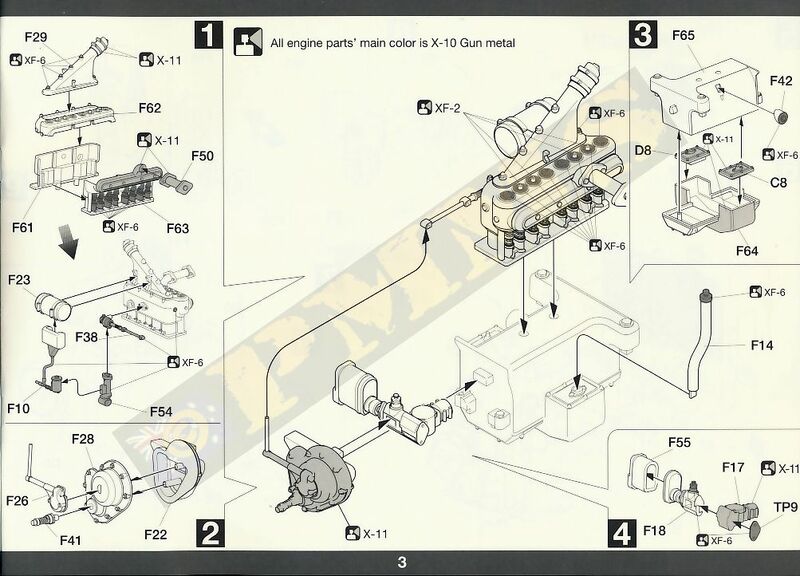 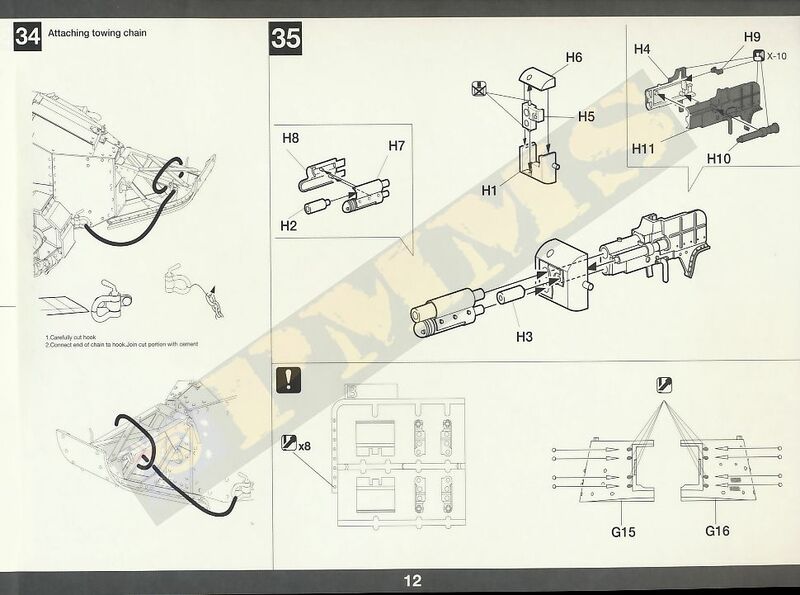 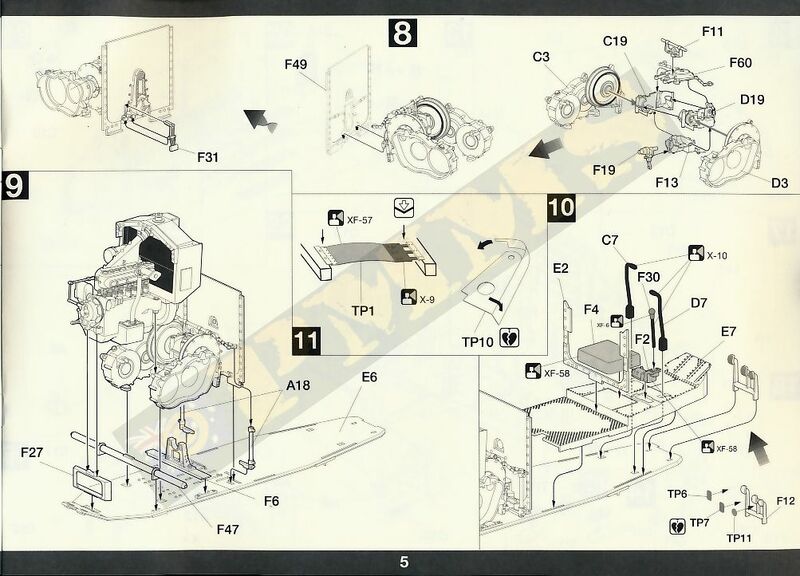 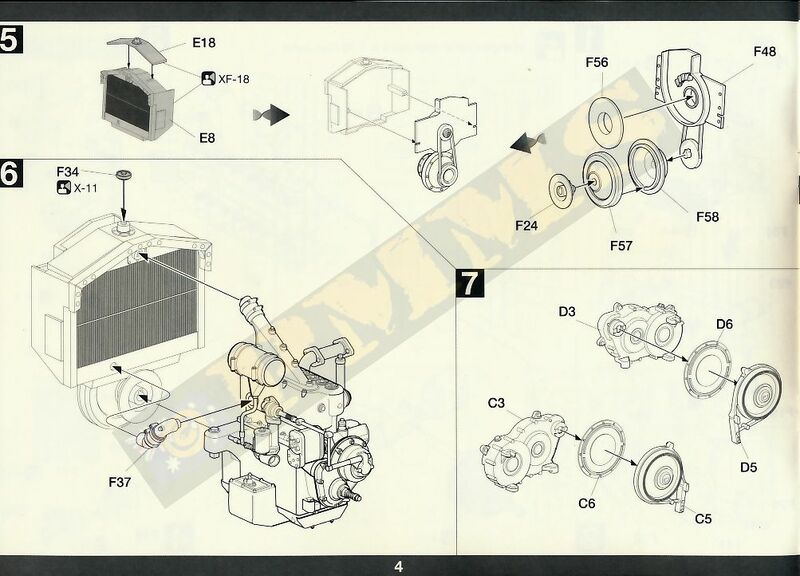 The instructions are the usual exploded view drawings and are quite large making the part placement very clear and easy to follow, there are no complicated assembly sequences in any case so there shouldn’t be any problems following the assembly steps. 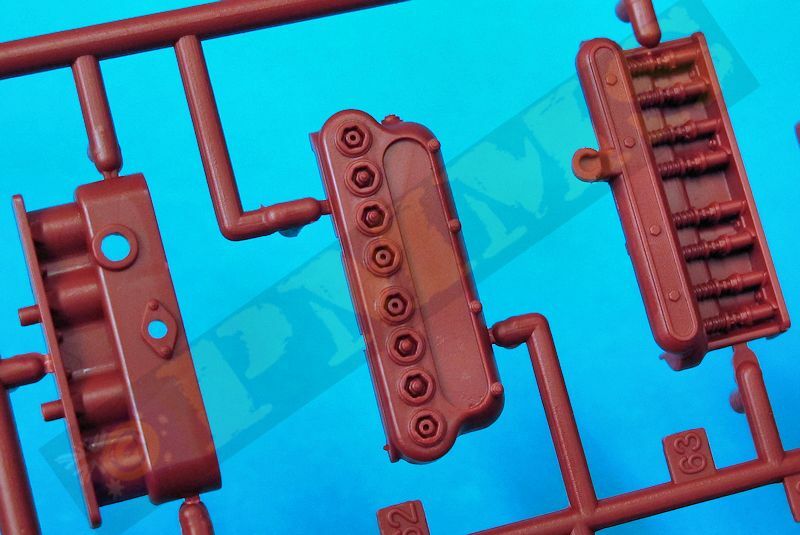 So overall while having the nicely detailed full interior of engine/transmission and Driver’s compartment it is a fairly basic kit much in keeping with the real thing, some areas have detail that is a little lacking in this scale such as the suspension springs and hull rivets and lack of surface texturing but the rest looks very well done and should build without too much trouble into an impressive kit in this scale. 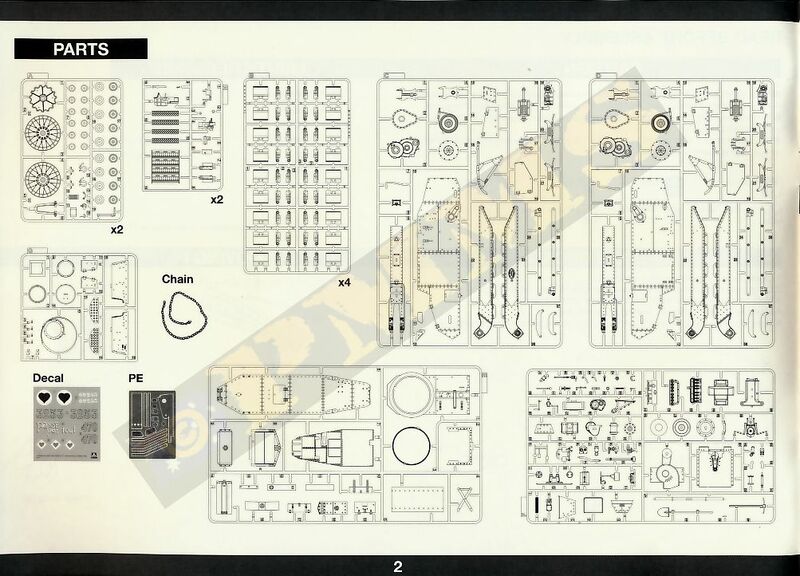 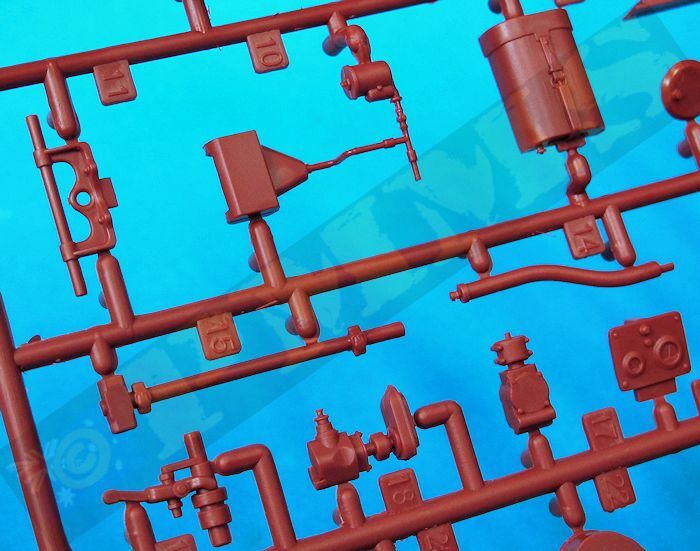 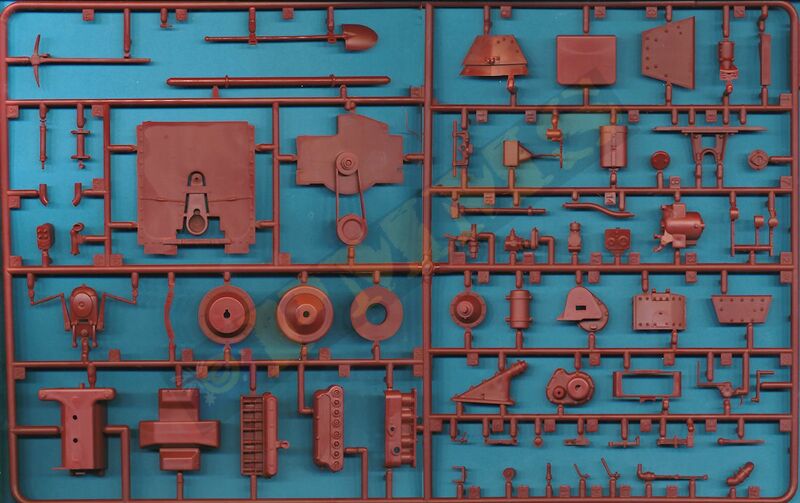 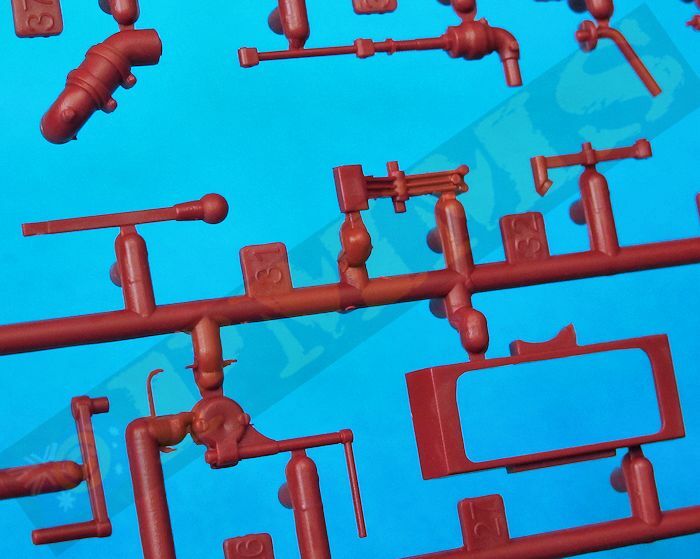 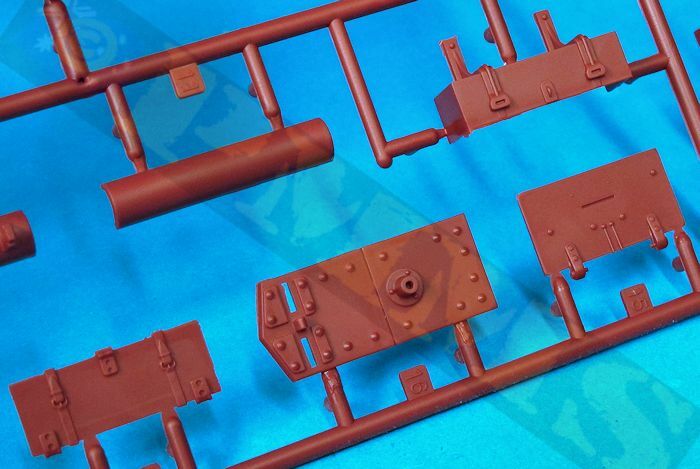 For a first up kit from Takom this looks to be well done overall and as mentioned this is just a quick preview of the kit contents with a more detailed look at the details, accuracy and build to follow as time permits. 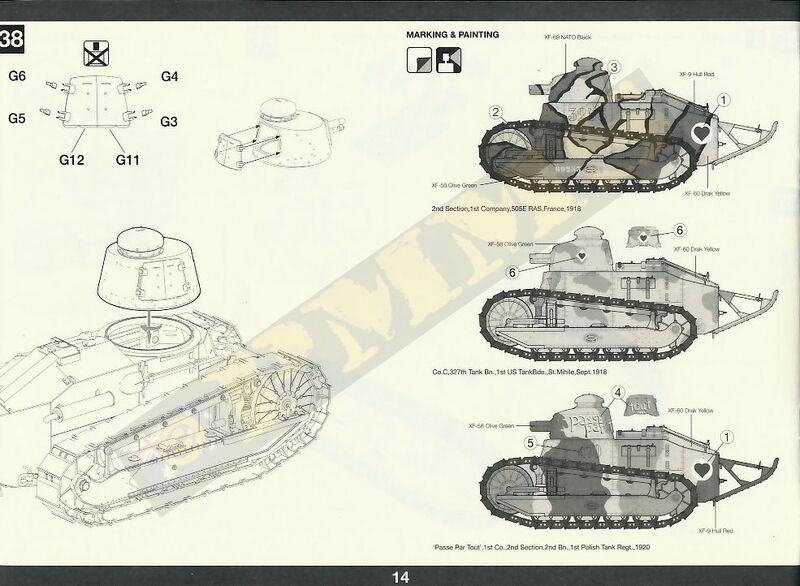 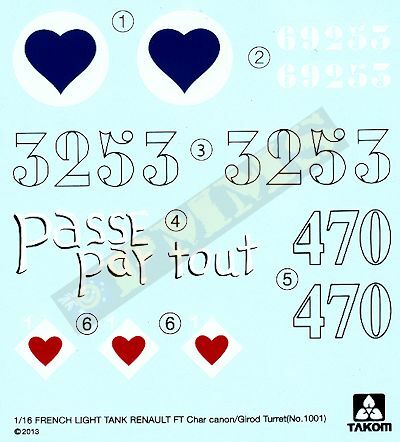 The decal sheet gives markings for three FTs, one French Army and one US Army in the last months of WWI plus a post WWI Polish vehicle with two of the schemes shown in colour on the box side while the B&W instruction booklet has just the left side view of the three vehicles which leaves the camouflage schemes on the rest of the vehicle a bit of a mystery and some additional reference will be needed to get the schemes done.